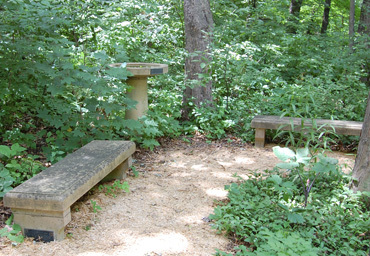 In past years families and groups have chosen to create within the Eloise Butler Wildflower Garden, a memorial for a loved one or a dedication for another significant person. Memorials are no longer allowed but certain dedications are. 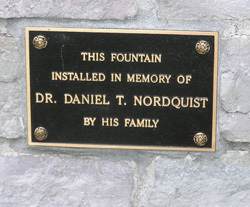 We illustrate here the memorials in the Garden and a few of the dedications. We start with the dedication to Eloise Butler herself. 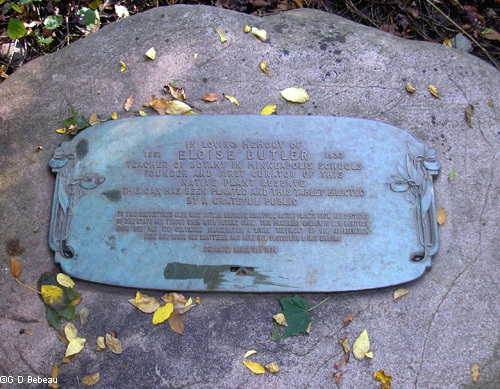 In loving memory of Eloise Butler (1851-1933), teacher of botany in Minneapolis Schools, Founder and first curator of this native plant reserve. This oak has been planted and this tablet erected by a grateful public. To this sequestered glen Miss Butler brought beautiful native plants from all sections of our state and tended them with patient care. This priceless garden is our heritage from her and its continued preservation a living testimony of our appreciation. Here her ashes are scattered and here her protective spirit lingers. Odell Family Memorials and Dedications in the Garden. 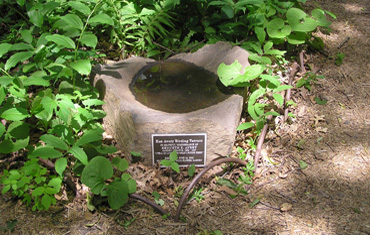 Clinton Odell was the founder of The Friends of the Wild Flower Garden. In the newspaper photo below are: left - Mrs. Carroll Binder (Dorothy) was one of the founders of The Friends and at the time, was President. -center- Martha Crone was also a founder of the Friends and at the time was Secretary - Treasurer and editor of The Fringed Gentian™. She had just retired from the position of Garden Curator. -right- Mrs. Clinton Odell (Amy). 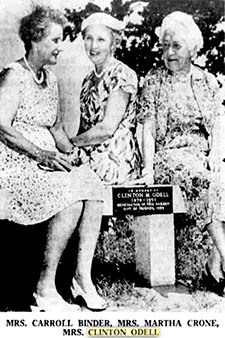 At the dedication of the memorial bench to Clinton Odell, 1959 Photo: As published in the Minneapolis Tribune, Minnesota Historical Society, Martha Crone Collection. 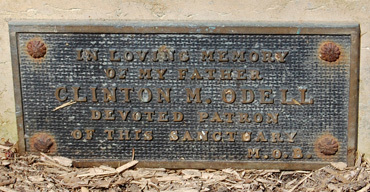 Above: The dedication tablet on the Odell bench in the Upland Garden. 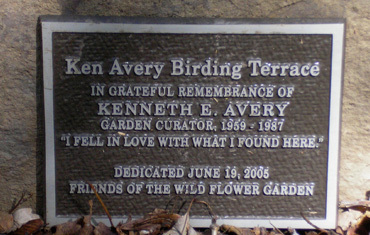 2nd photo: The dedication tablet for the bird bath (photo below) in memory of Amy H. Odell who passed away on Dec. 7, 1966. 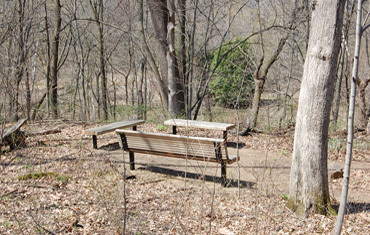 Below: A pair of Kasota Limestone benches dedicated to Clinton Odell, located just off the patio area in front of the Martha Crone Visitor's Shelter in the Woodland Garden near the location of the former Garden Office (dedication tablet at left). These were presented by his daughter, Moana Odell Beim; installed in 1960. 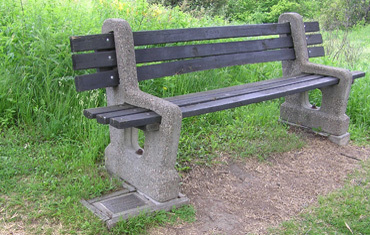 They replaced a pair of wooden "settees" that at the time, were very close to the site of the old "office." 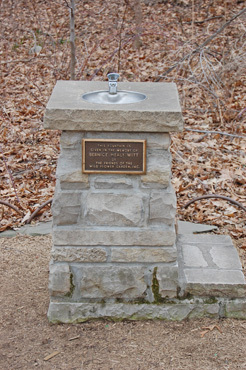 The bird bath of Kasota limestone, is dedicated to Amy H. Odell, spouse of Clinton Odell; it was presented by family and friends in 1968, and is located between the two benches. In early 2018 a tree fell on the bird bath and cracked the basin. 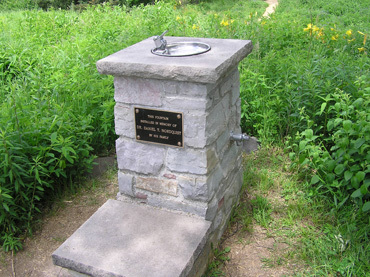 The cement shop foreman of the Park Board formed a new limestone top to match the original (larger photo below). (photos G D Bebeau). Funding for the memorial came to The Friends via a $5,000 gift from the Baker Family that was administered by People for Parks. 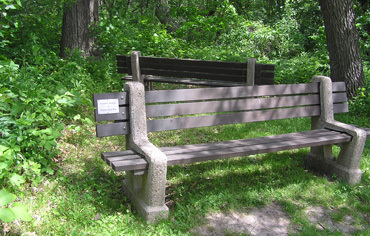 The history of the Baker bench is explained in this letter to The Friends from Zachary Baker: I am a native of Minneapolis, and last lived there about 30 years ago. 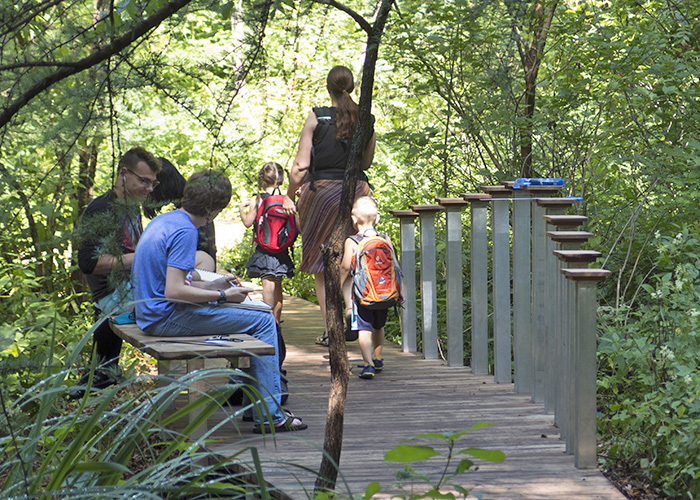 I visit the Wild Flower Garden whenever I get back to town – some of my earliest childhood memories are connected with outings there. 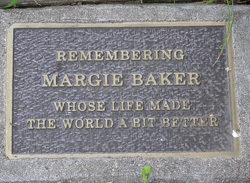 For my mother, the late Marjorie Baker, the Garden was a very special place, and after she passed away (1973) my father arranged to have plaques in her memory placed by two benches – one in the forest garden, the other in the prairie garden. My father, Mike Baker, died a little over a year ago, and I have been to the Garden several times during visits connected with estate matters. I feel that the very least I can to is to join the Friends as a sponsor. That way, the Baker family will maintain its connection to the Garden for the present and future. Zachary Baker. 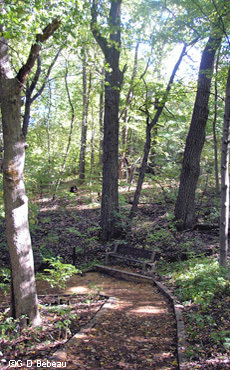 Bench dedication in 2005 to Lucy and Ernie Furman, pets of Peter Furman. 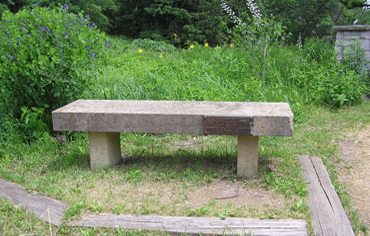 Other benches: The two benches on the path from the front gate down to the Crone Shelter are memorials for Dr. Marion Grimes and Harold E. Dahlquist. 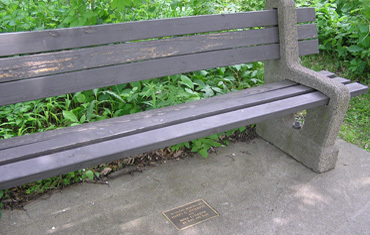 This bench which sets just outside the Front Gate to the Garden is in memory of Dr. Frances Schaar who was a member of The Friends in the 1970s. 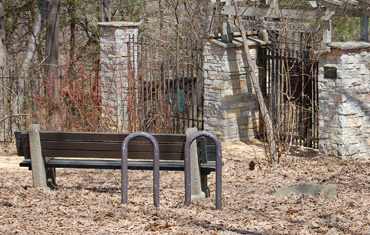 The Bike rack was provided by The Friends of the Wild Flower Garden - and is not affiliated with the Bench dedication. The initial plans for the Martha Crone Shelter called for a Franklin Stove as a fireplace was thought to be too expensive for the Friends' budget. That is when Friends members Mr. & Mrs. Alexander Dean stepped in and provided the funds to construct a fireplace, the exterior of which is cut stone from Wisconsin. The gift was a memorial in memory of their daughter Kathleen Dean Hilman from both the Deans and from Kathleen's Girl Scout friends. 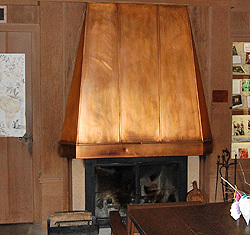 A plaque is on the wall to the right of the mantle. 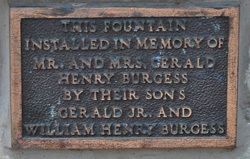 Fountain located just inside the front gate of the Garden, installed in 1986 in memory of Mr. and Mrs. Gerald H. Burgess and presented by their sons. Mrs. Burgess (Louise) died October 10, 1973 in San Diego California where she had lived since 1965. She was a Friends member until her death. She had organized and counseled family-life groups in Minneapolis more than forty years and wrote a column entitled "Let's Be Better" for the Edina Courier from 1950 to 1960. She was also an author, her first book being This side of the stars. (photos G. D. Bebeau). 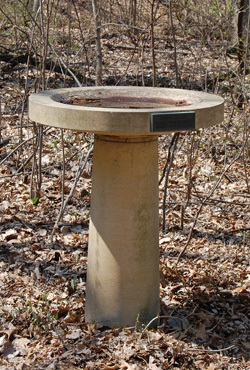 Fountain located on the patio area in front of the Martha Crone Visitor's Shelter in the Woodland Garden, given by The Friends of the Wild Flower Garden in memory of Bernice H. Witt and installed in 1971. Her husband, Alvin Witt was a member of The Friends and chairman of the building fund for the new Martha Crone Visitors Shelter. He died in 1973. (photos G. D. Bebeau). 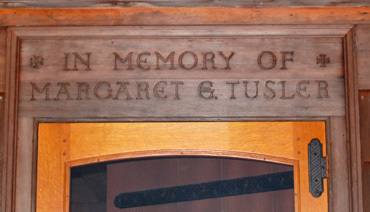 The lintel over the door to the Martha Crone Visitor's Shelter is engraved in memory of Margaret Tusler who passed away on April 1, 1969. It was installed at the time of construction of the shelter. 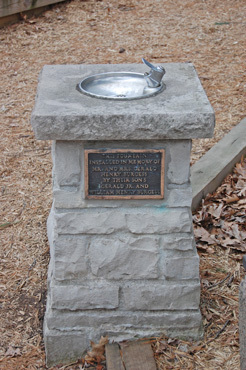 Her husband, Wilbur H. Tusler, was chairman of the building committee for the Friends of the Wild Flower Garden. The committee planned the shelter and saw to it's construction in 1969-70 (photo G. D. Bebeau). 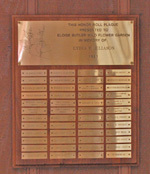 Eliason Memorial Board: A gift of Marian Eliason in 1981 in honor of her mother, Lydia Eliason and presented to The Friends of the Wild Flower Garden. 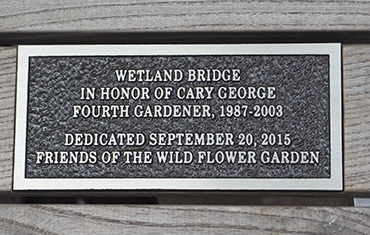 It is engraved with a dedication to the Eloise Butler Wildflower Garden. 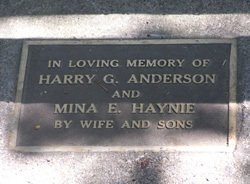 Names of people for whom the Friends have received significant gifts or memorials. For details see Memorial Donations. 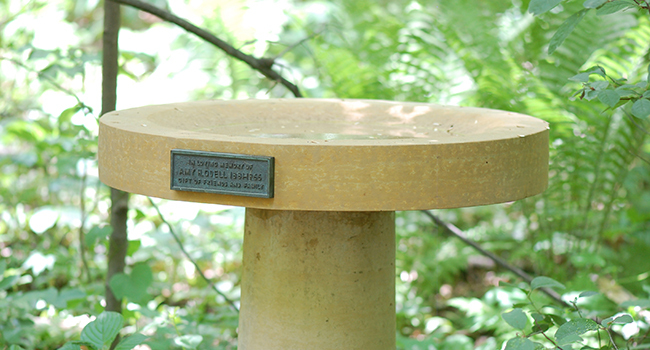 The 81 x 42 inch Walnut table in the Martha Crone Shelter was a gift of Ms. Elizabeth Schutt in memory of her mother, Mrs. Clara M. Schutt, who was a good friend of Eloise Butler and from whose property, Eloise Butler acquired plant specimens for the Garden. 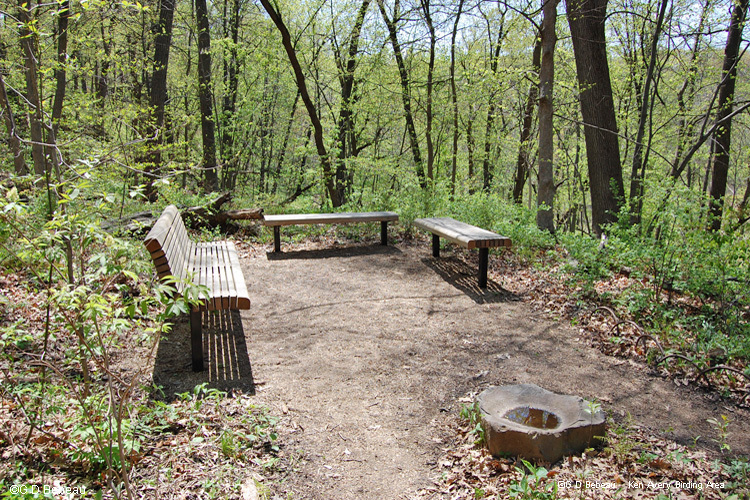 Below: The Avery Birding Terrace in late April before new plant growth. 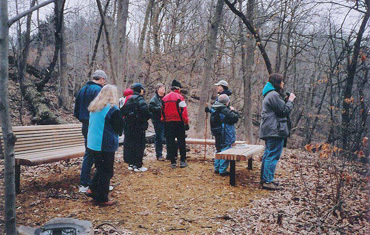 An early April birding group, led by naturalist Tammy Mercer (with staff in hand), at the Ken Avery Birding Terrace, 2006 (Photo Phoebe Waugh). 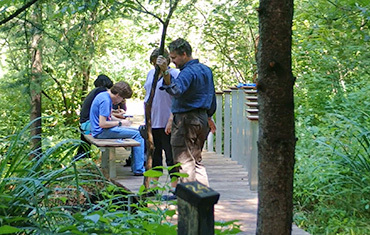 Details on the Boardwalk Project. Moana Odell Beim Adopted Tree Area. 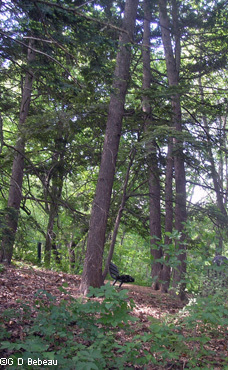 In 2007 group of trees in the Hemlock grove near the back gate of the Garden was adopted by the family of Moana Odell Beim. She was the daughter of Clinton Odell, founder of The Friends. She served for many years as a member of The Friends and was president 1975-1976. Lisa Locken Adopted Oak. 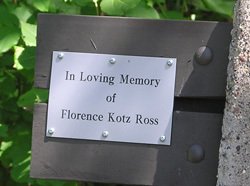 In 2007 a large oak tree on the path down to the Martha Crone Visitors Shelter was adopted in memory of Lisa Locken by a group of her friends. She served for many years as a member of The Friends and as editor of The Fringed Gentian™, our newsletter.